Learn how Pace can help you and your team make sure that your timesheets are always complete. Every hour logged in TrackingTime is 10x more valuable than in Excel or written on a piece of paper. That's why we want to make it as easy as possible for you and your employees to keep track of each and every hour you work. The more hours you track, the more accurate your reports will be. That's why it's important that your team keeps tracking all their hours consistently, every day. Here's where Pace comes into play. Pace has two main components: Work schedules and the Pace Board. Work Schedules allow you to specify the number of hours that your employees have to work each day of the week. You can set up as many schedules as you need. The Pace Board gives you a monthly overview of the hours scheduled for each team member per day versus the hours they actually tracked. Missing hours can be added and existing time entries can be edited with just a few clicks. Go to Company > Work Schedules. Click on "Add a new schedule". Enter a name for your new schedule, e.g. "Weekly Schedule". Specify the number of hours employees associated to this schedule should track each day of the week. 0 or Blank means no work required. Choose the employees that you want assigned to the schedule. Notify users by email: If selected, we'll verify every day the number of hours tracked by employees the day before. If they have missing hours we'll send them an email alert reminding them to complete their timesheets. Set as default: If selected, new users added to your account will be automatically assigned to this schedule as default. You can edit users associated to a schedule anytime. Click "Save" to add the new schedule. 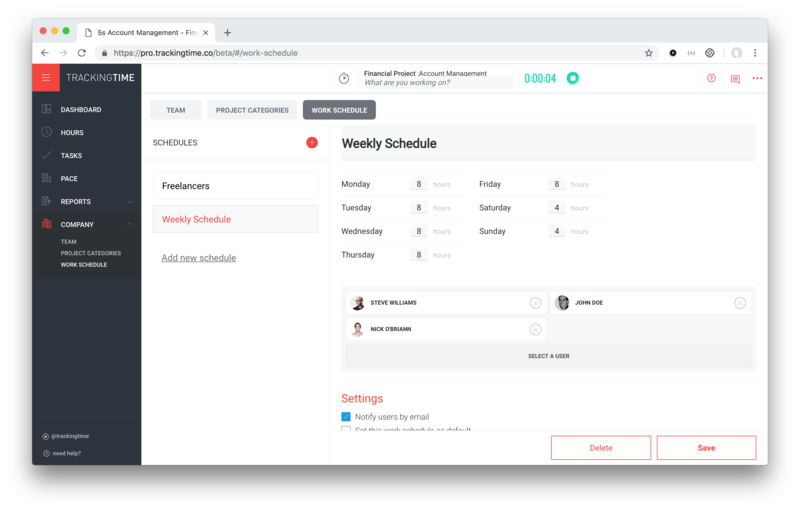 Every day, we'll automatically verify how many hours each and every person in your team was supposed to work the day before and how many hours they actually logged. In case a person didn't complete her daily timesheet, we’ll send her an email reminder to submit the missing hours. The Pace Board gives you a monthly overview of both scheduled and tracked hours by every team member at a glance. 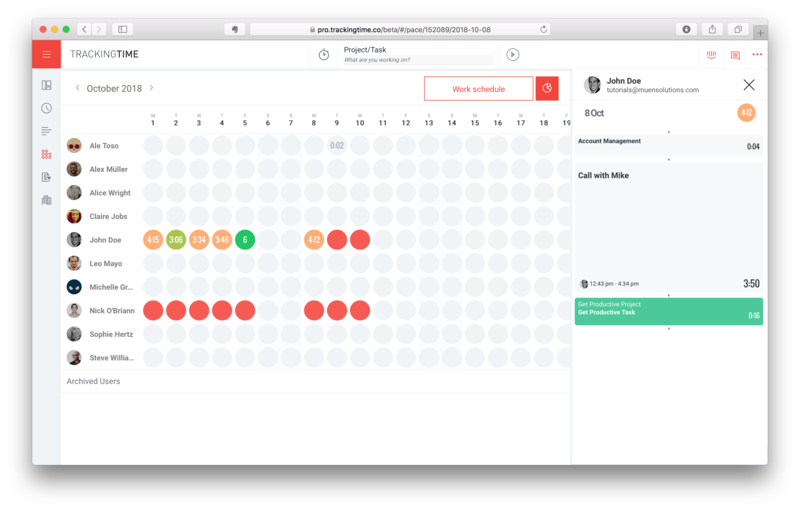 A simple color model allows you to quickly identify who's missing hours and to complete their timesheets. Light grey: The user has no hours scheduled for the day. Dark grey: The user has tracked hours on a day that he was supposed not to be working. Light red : The user was scheduled to work, but didn't track any hours. Red: The user has tracked less than 25% of his scheduled hours. Yellow: The user has tracked between 25% and 50% of his scheduled hours. Warm green: The user has tracked between 50% and 75% of his scheduled hours. Green: The user has tracked more than 75% of his scheduled hours. Click on any dot of the board to display the work activity of the selected person and date. Edit or add missing time entries as required. Click on "Archived Users" to display all currently archived users in your account. Click on "Work Schedules" to manage your work schedules. Click on the Insights button to display a series of charts that visualize your time data.